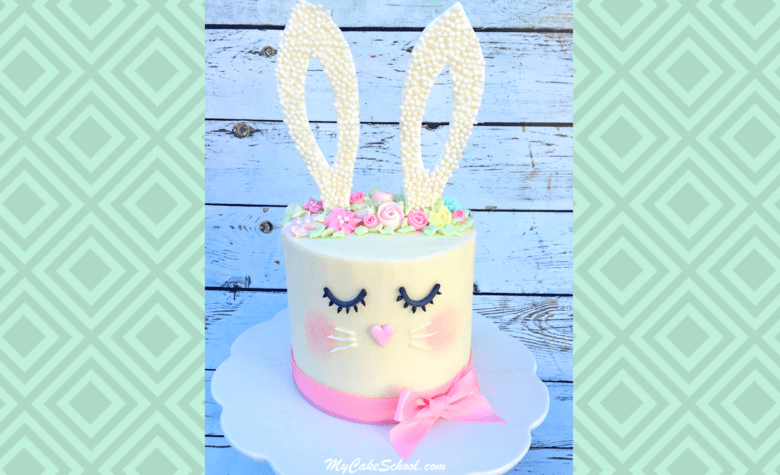 This sweet and simple Bunny Cake tutorial is a new favorite of ours for Easter gatherings! Bunny cakes have been popping up everywhere lately, and in this tutorial, we’ve created our own fun spin on the popular design. 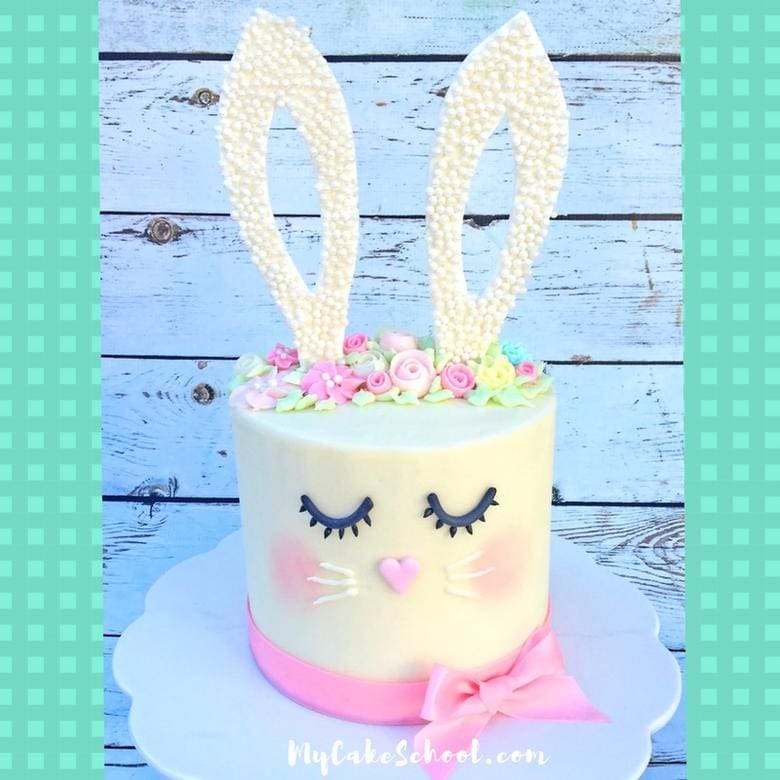 I love that this sweet bunny cake can be made with buttercream! As usual, we are working with a crusting buttercream today which develops a light crust. We used our classic vanilla buttercream frosting recipe for this cake which contains no shortening but our fluffy vanilla buttercream recipe is a great option too! Use your buttercream frosting of choice (or rolled fondant over chilled fondant or ganache if you prefer)! Our bunny’s ears are made from gum paste which was dried a couple of days in advance. It’s always a good idea to use gum paste (or you can use fondant with tylose powder kneaded into it) for pieces that need to dry firm, quickly, and to be able to stand upright. A couple of days is usually a safe bet– sometimes it may take less time, or if you are in a humid climate, it may take longer. Also, always make an extra just in case of breakage! After the ears dried, we flipped them over, attached the lollipop sticks to the back, and attached sugar pearls using piping gel! Our cake consists of four 6 inch cake layers which we frosted in buttercream and smoothed using the hot knife method of smoothing. The great thing about this cake design is that it could work with any size of cake. We added buttercream flowers to the top– simple rosettes or fondant cut-outs & ribbon roses would be sweet too! For this tutorial, we used four 6 inch layers of our Yellow Cake recipe from scratch frosted with two batches of our Classic Vanilla Buttercream. misc. small paintbrushes for applying petal dust, piping gel, etc. Thanks for stopping by! If you’re looking for more Easter Dessert inspiration, make sure to check out our Roundup of Favorite Easter Cakes, Recipes, and Tutorials! If you’re looking for fabulous cake and frosting recipes, we have our full collection of favorites in our Recipes Section. You can find more fun cake tutorials in our Free Tutorials section, or if you’re interested in having access to our entire library of cake video tutorials, you should consider becoming a member of My Cake School! You can find all of the details here: Membership Details for MyCakeSchool.com. Super cute! :-) Love it! I always feel delighted when i see a cake like this. This is really exceptional. I can bet no one would resist there self from having a bite of this.I would love to have this on any moment. Thanks for sharing. What cake pans do you prefer using? Hi Valerie, We use aluminum pans by Magic Line. Will a strawberry cake be firm enough for this bunny cake? Hi Alicia, yes that should be just fine!